No need to worry about running down your cellphone battery this festival season. Vodafone’s “Power Pocket” promises to keep peripherals pumping on little more than body heat and movement. You won’t have to fret over missing a beat, either: Prototypes are available in the form of denim shorts and a sleeping bag, which means you can charge your gear while you walk, dance, or even nap. Debuting at the Isle of Wright Festival on Thursday, the Power Pocket is a collaboration between the British telecommunications company and the department of electronics and computer science at the University of Southampton. Each smart material contains thermoelectric modules that convert temperature differences—say between your sweaty, gyrating behind and the surrounding air—into electric voltage, a concept known in physics as the Seebeck effect. A full day of strutting and shimmying in the Power Pocket shorts will charge a smartphone for four hours. Vodafone will be running trials of the technology throughout the summer, but even initial results will be music to revelers’ ears. “Eight hours in the sleeping bag, roughly speaking, will provide 24 minutes of talk time and 11 hours of standby time. That’s assuming the inside of the sleeping bag is 37 degrees [Fahrenheit]—human body temperature,” Beeby says. 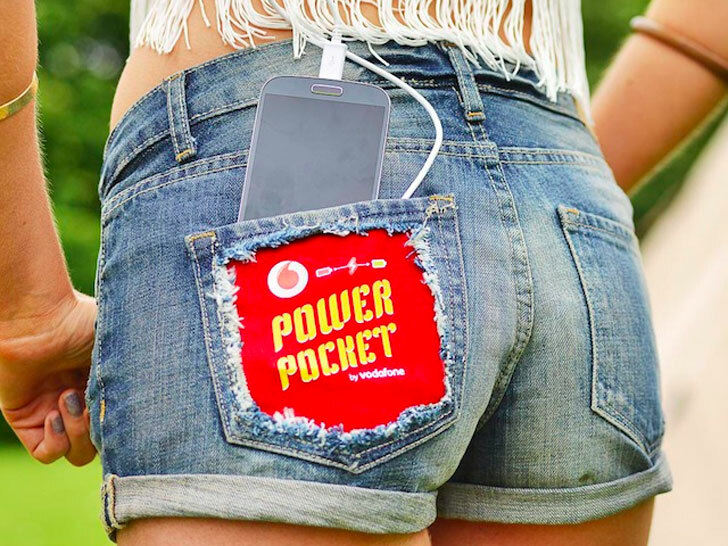 Likewise, a full day of strutting and shimmying in the Power Pocket shorts will charge a smartphone for four hours. Beeby and his team need to tackle a few details before the device is ready for center stage, however. “There’s lots of research still needed around making this technology hard-wearing,” he explains. “Sleeping bags, for example, need to be folded up and compressed into quite a small package. These materials at the moment are flexible, but there are improvements to be made still. No need to worry about running down your cellphone battery this festival season. Vodafone's "Power Pocket" promises to keep peripherals pumping on little more than body heat and movement. You won't have to fret over missing a beat, either: Prototypes are available in the form of denim shorts and a sleeping bag, which means you can charge your gear while you walk, dance, or even nap. Debuting at the Isle of Wright Festival on Thursday, the Power Pocket is a collaboration between the British telecommunications company and the department of electronics and computer science at the University of Southampton. Each smart material contains thermoelectric modules that convert temperature differences�say between your sweaty, gyrating behind and the surrounding air�into electric voltage, a concept known in physics as the Seebeck effect.